For anyone attempting recovery on their own; because fighting an addiction is tough, especially at home. This guide provides an extensive overview of what addiction is, the warning signs of abuse, how drugs and alcohol affect the mind and body, as well as various Recovery options. 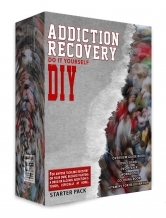 The "Addiction Recovery DIY" workbook, for conquering recovery at home, contains 142 pages of exercises utilized by professionals in rehabs, clinics, and doctors offices around the world. This motivational Adult Coloring Book was for created to support anyone in Detox or Addiction Recovery for relief at home, in a clinic or hospital, or during an extended stay at a residential rehab facility through Art Therapy. Getting and staying clean can be a stressful and lonely experience, with various challenges. Drug & Alcohol dependence leads to deficiencies of Vitamin B1, B5, B6, C, and E as well as calcium, magnesium and niacin. These nutrients are essential for the body and as such, a lack of any one could result in a multitude of health-related concerns. Treatment centers often prescribe high doses of these nutrients in order to reverse the depletion caused by substance abuse.